Heavy Rain could easily earn its spot as a Game of the Year nominee for being an important experiment in marrying storytelling with interactivity. Its unusual control scheme, which uses the controller's thumbsticks and motion sensitivity to approximate real life movements, goes a long way towards tearing down the barrier between player and avatar. 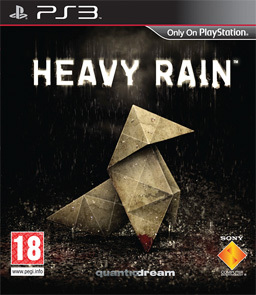 Whether or not history deems it a success, Heavy Rain's attempt to redefine the game experience will be discussed for years to come, but what makes it a nominee for Game of the Year is its ability to make us feel connected to its characters - at times painfully so. The game begins with a tutorial so banal it's almost a parody. As Ethan, you putter around your house, taking a shower and drinking some orange juice until your wife comes home and asks you to help her get the house ready for your son's birthday party. You arrange a few place settings on the dining room table, then head out to the back yard to play with your kids. It's the kind of achingly boring suburban activity that's immediately recognizable and so ordinary that it feels horribly out of place in a videogame. And that's before you head off to the mall to buy shoes. But it's at the mall, when your son wanders off and you begin to search frantically for him through the crowd that you begin to realize that your time with Heavy Rain will be different than with other games. That moment is not about finishing a level or completing a quest; you forget the game you're meant to be playing, because all you can think about is finding your son before god-knows-what happens to him. After tragedy strikes, we feel the emptiness mirrored in Ethan's dingy apartment. Heavy Rain's technical limitations prevent it from achieving everything it sets out to do, but its experience was unlike anything else we played this year. Click here for our full written review and video supplement.